Description: The Behavior Analysis plugin performs regional behavior analysis based on a user selected brain region of interest (ROI). The image where the ROI is defined must be in the Talairach brain space before processing. You should verify that the origin is correctly positioned (press 'o' key in Mango), since analysis is coordinate based. 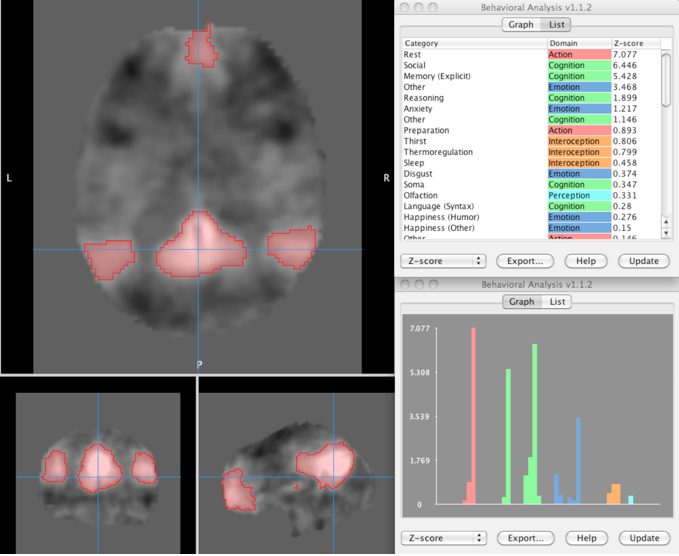 Talairach spatial normalization can be done using Mango's SN plugin for anatomical images. If your image was aligned using the MNI brain template you can use the MNI-to-Tal transform, which is an option in the transform menu (Mango v2.6 and later). Results of behavior analysis are presented for BrainMap's five Behavioral Domains (Action, Cognition, Emotion, Interoception, and Perception) and sixty sub-domains (figure). Only z-scores >=3.0 are considered significant (p<=0.05 with Bonferroni correction for multiple comparisons). A behavior profile chart and z-score ranked table (figure) are provided to assist with interpretation. The figure is an example of using behavior analysis with resting state ICA images. Data in the figure is for the ICA representing the default mode network (Smith et al., PNAS 2009). The red ROI was made using a threshold at z=3. 3.1 (02-04-2019) — Moving Domains to the left-most column in the list view. 3.0 (02-03-2019) — Updating BrainMap Behavioral data. 2.2 (11-25-2015) — Clicking above-threshold list rows will now highlight associated areas in the slice viewer. 2.1.1 (06-05-2015) — Added script support. 2.1 (04-18-2014) — Added "All/Normals" selection box; UI changes. 1.3 (04-18-2014) — Minor UI enhancements; fixed bug causing Export button not to work. 1.2.1 (03-18-2014) — Minor change to support plugin API updates. 1.2 (01-24-2014) — Added command-line support. 1.1.2 (05-11-2012) — Initial public release.